Meaning 'safe haven' in Arabic, Mamunia was the name of a house in Lagos, Nigeria, the city where much of Wings' 1973 album Band On The Run was recorded. According to issue 41 of Club Sandwich (1986), the fan club publication from McCartney's MPL Communications, Paul and Linda once stayed at a hotel with a similar name in the Moroccan city of Marrakech. The spelling was slightly different, but the misconception that Mamunia was named after the hotel was believed by many. The lyrics are chiefly concerned with rain in Los Angeles, although the song was inspired by a 1973 visit Wings made to Tunisia. In the song, rain acts as a metaphor for rebirth and renewal. McCartney's statement that the weather "ain't bad, don't complain" bears a similarity to John Lennon's words on The Beatles' 1966 b-side Rain. Fittingly, the song was recorded in a heavy storm in Lagos, Nigeria, the first song to be taped during the Band On The Run sessions. One of McCartney's road crew kept a rhythm on a bass drum on the recording, though was uncredited. Paul McCartney's fingerpicked acoustic guitar on Mamunia recalls his work on the 1968 White Album sessions, notably his songs Rocky Raccoon and Mother Nature's Son. Mamunia was the initial b-side to the Jet single, although initial pressings were withdrawn in early 1974 and the song was replaced with Let Me Roll It. The change occurred as Mamunia was being considered for a single release in its own right. A charming mostly-animated video for the song was produced and directed by Jim Quick in July 1974, and did not feature McCartney. 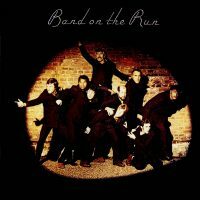 Although rarely screened at the time, it was included on the DVD of the 2010 reissue of Band On The Run. Question about the keyboard (or it merely which setting) was used at the end of the song. When this first came out everyone called it a “Synthesizer”. Well, now EVERYTHING is called a Synthesizer. This is a unique sound, that reminds me of a continuous sine wave (?) that smoothly climbs up or down through all of the in between notes to the next note (key) pressed instead of “ending” the previous note and “beginning” the new note. Perhaps it can be called a “slider” (“bender” or something), but that has no control over exact notes. If one was to replicate this sound they’d need a sine wave generator and a means of rapidly cranking the up or down frequency to the next “note” and stopping on it exactly. (1) What kind of a keyboard (or setting) is capable of doing this, and (2) are there other songs out there that have this same kind of sound? Many synths are capable of this. Its called portamento. You can control the amount of portamento between a note and the next. The more portamento you use, the more of the slide effect you hear. It has to be done with monophonic (one note at a time) sounds. Vintage synths from the 60s and 70s, mailny monophonic, had that portamento capability. I think the synth in Mamunia is probably a Minimoog. Does anyone know who the man at the end of the Mamunia video is?